Cut the tomatoes in halves or quarters. Squeeze out the seeds, or don’t (I never mind a few seeds in the sauce). Using a hand held grater, place the cut side of the tomato against the large holes of the grater and gently rub until only the tomato skin remains in your hand. a skillet over medium heat, add the peeled tomatoes, add a pinch of salt, a little olive oil, a garlic clove and a sprig of basil. 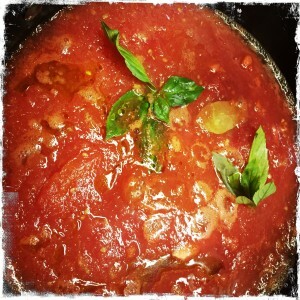 A spoonful of tomato paste helps thicken the sauce. Let it simmer for 15 to 20 minutes. Cook the pasta in a large pot of well-salted water, making sure to keep it quite al dente. Put butter in a wide deep skillet over medium heat. Add drained pasta to the pan and season with salt, pepper and crushed red pepper, if using. Add tomato sauce gradually and stir to coat pasta, using only enough sauce for a light coating (you may not need the entire 2 1/2 cups). Transfer pasta to a warm serving bowl and dot top with spoonfuls of ricotta. Sprinkle lightly with pecorino and garnish with a few torn basil leaves. As a neapolitan who had this dish many times in the distant past, the recipe is slightly different. To make the creamy tomato sauce, the method suggested is useless it will probably grate your hand not just the tomatoes. 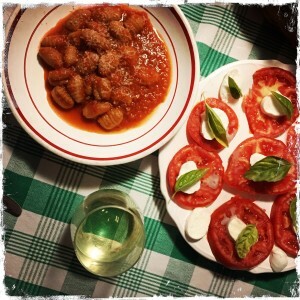 Just cook the fresh tomatoes, cut in four parts, with e. v. o. oil, garlic, few lives of basilico, for ten minutes. Until all is very tender and creamy. Then strain it all with a spoon and let all the cream out. Finish the cooking of the sauce few more minutes together with the pasta you have chosen. In a dish put a lot of “ricotta” at least 100 grams, and then throw the pasta on the ricotta and mix it all. Buon appetito!